The cat's away so we're playing - Stop staring and start sewing! Joey is in Oregon fishing so I'm sewing like crazy here while the kids watch dvd's and play with their Playstation. We're also dogsitting for our next door neighbor while he's gone and he has a new pool so the kids are putting that to good use, so it's not like they're sitting around all day long. Anyway, I hate to be a one trick pony here with all these girls clothes I'm sewing but I'm trying hard to pay off my girls' classes from last year and start paying on the next year so I don't get behind again. Although we are officially homeschoolers I try to farm them out as much as I can since I don't want to re-learn algebra and other things. They enjoy the classroom setting and I enjoy the break! The sewing would be a burden (as if!) except I just love all these new fabrics so at least I'm having fun. 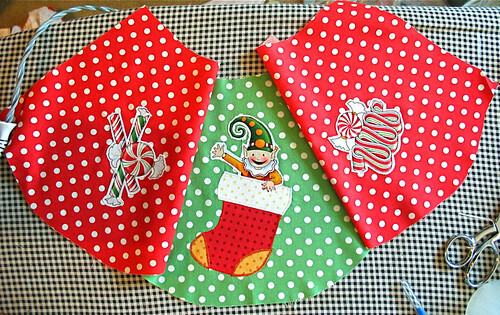 I'm working on this happy little outfit made from Mary Engelbreit's Christmas fabric (you know how much I love her) and it's really turning out cute. 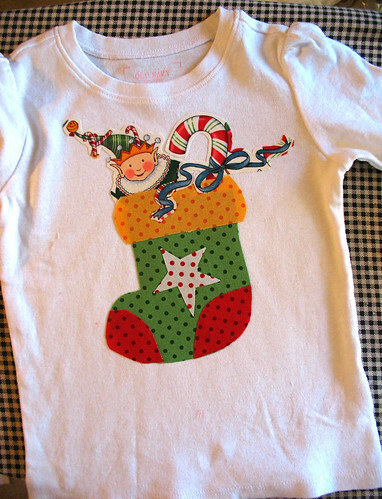 I know it's July but ebay boutique shoppers are already getting their Christmas wardrobes lined up! I get my Christmas outfit figured out on December 24th! 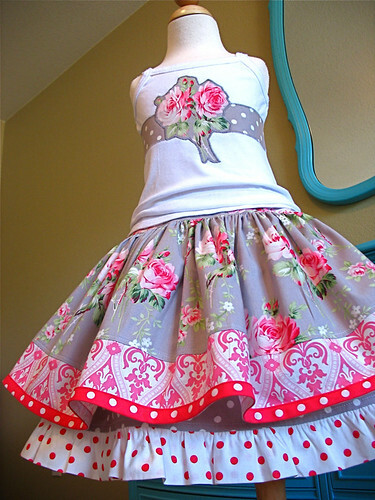 Look at the front panel of the skirt. Isn't he cute? 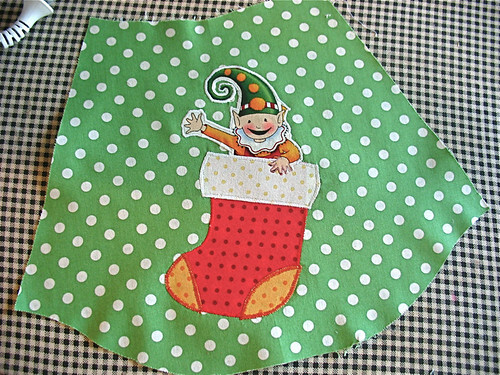 I used a part of one of the big fabric panels for the elves and candy. I did some tricky cutting and stitching to get his little hand to hang over the cuff of the stocking like that and I'm pretty proud of myself! With the two side panels. Getting cuter! And then here's the shirt so far. Really cute if I do say so! I have one more Christmas dress to do after this and then I've got to get a back to school outfit done. Crazy! Oh and I'm going to extend my sale on this Christmas fabric for 2 more days (until the 17th) because I'm too busy sewing (or just too lazy, whatever) to go change all the prices back to normal. I spent a little more time playing with the Ava Rose fabric. I really really love it and I think this outfit turned out so cute. Darn my girls for growing so big! Well, back to work. Joey will be home tomorrow night so I've got to strike while the iron's hot while burning the midnight oil and reaching for that brass ring as I keep my nose to the grindstone. Got that? Listen to my interview with Pat Sloan. It's kind of a big deal. A new direction and my first youtube video tutorial! What's new - Have you seen Bari J's new Joie de Vivre fabric?